Today is Bell's Bell Let's Talk Day! Let's fight to end the stigma surrounding mental illness. 1 in 5 Canadians will experience a mental illness in their lifetime. Use the hashtag #BellLetsTalk on social media to take part! 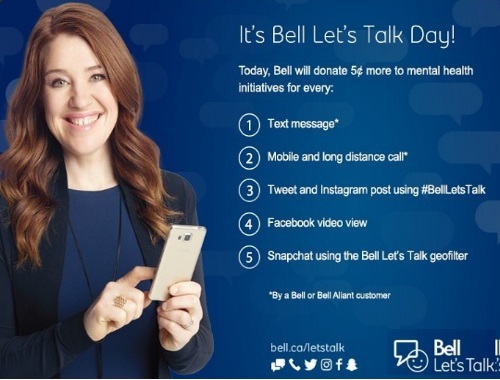 For every text, call, tweet and Instagram post, Facebook video view and use of Snapchat geofilter, Bell will contribute 5 ¢ more to mental health initiatives. So let’s work together to create a stigma-free Canada! This event is available January 25, 2017 only.